This disc is something I have had in bootleg form for quite a few years but it’s nice to finally get it with some upgraded sound. 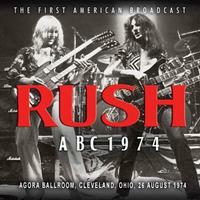 This is a recording of a radio show that Rush did in 1974 at the Agora Ballroom in Cleveland (hence the name ABC). Neil Peart was new to the band and this was on their first tour of the states. ABC 1974 is a great addition to any Rush fan. Obviously it is a far cry from their prog heyday material, but it shows the band in early, hungry form. The great thing about this disc is that it contains a couple of rare tunes that never made it onto any Rush records. Both “Fancy Dancer” and “Garden Road” are included here and it is great to finally get some “unreleased” Rush tunes. To finish off this CD we get a few songs performed at the same location almost a year later. All in all this is a great package. This review is available in book format (hardcover and paperback) in Music Street Journal: 2012 Volume 2 at lulu.com/strangesound. It was a great tune to open their first record so it just stands to reason that it would be a great to start the show. It is performed pretty much like the studio version but you can sense a bit of urgency in the performance. It is probably this recording but this seems a little more raw and louder than the studio counterpart. This is actually “Best I Can” from Fly By Night and it is an early version as the album wasn’t released yet. I would have to hear them back to back to see if there are any real significant differences but based on the performance, it was fleshed out a while before the Fly By Night record was released. They go back to the first record and perform a tune that many Rush fans have not heard live. Since the recording is so old, many fans haven’t heard these tracks in a live setting. It sounds a little faster than the studio version and Geddy Lee’s voice is higher (if that’s possible). Another track from the forthcoming Fly By Night album, this again sounds pretty close to the version that was released on the record. Lee’s vocals are a little off from what I’m used to hearing but for the most part, the band is right on the money. Based on the performance, we can assume that the songs were pretty much ready for the record. It is great to finally get something unreleased from Rush and here we have an AC/DC styled rocking blues tune. Alex Lifeson really shows off his playing here with a great solo. It’s a good track and had there not been the length limitations of vinyl, it might have made the first record. Here is another great track that was in the Rush set list for many years. It sounds just as good as the studio version. Although many people may not have heard this track, it was in fact released as a single before the band was signed. It is a cover of a Larry Williams song and it has that blues rock sound that Rush did so well in the early days. I have not heard the studio version, so I’m pleased that I now have the song in my collection. I can understand where the Led Zeppelin comparisons are coming from when I hear this song. It is a longer, lumbering piece that I can see Page and company performing. Lifeson really shreds it up on this one. It was never really a favorite of mine but I like it in the context of the concert. After such an upbeat set so far, this gives the audience (and the band) a little time to catch their breath. The band finish off the set with their classic tune from the first record. I always thought the definitive version was the one on All The World’s A Stage and this rendition has not changed that, although this one comes close. Peart is one of only a few drummers that I believe deserves a solo spot in the show. His solos have evolved over the years so this one is a little different from what you might have heard on the other live releases. It’s a very short solo and not as inventive as his latter works but this was only his tenth show with the group so we can cut him a little slack. Even though Lee announces “Working Man” as the last number, the band launch into this classic. It is very close to the studio version so there are no real differences. Here we get another rare track. This one boogies along with the same blues rock swagger that the other material possesses. It’s a great tune and another fine addition to any Rush fan’s collection. The sound quality is a little muddy on these bonus tracks but it is still great to get old Rush live material. The band is in fine form and they play this tune perfectly when compared to the studio version which was only a few months old. We really get a bootleg feel on this one as the sound quality seems to get a little worse. The performance is great; I just wish the sound quality was better. I guess that is why it is a bonus track and not part of the main release. The sound quality still suffers a bit but I’ll take any Rush material I can get my hands on. The tune is played a little faster than the studio version and that probably has to do with the energy of the stage. The song also ends abruptly like they ran out of tape.